Life Cycle: Caused by the larval (maggot) stages of very small flies called midges. 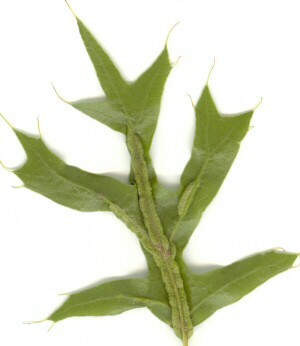 The gall's existence begins when the unfolding leaves start flattening out. The midge lays its eggs. 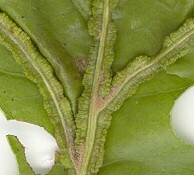 The eggs hatch and the tiny maggots move to the veins and begin feeding. This causes the vein tissue to start growing, and in a few days the maggots find themselves encased in the fuzzy gall tissue. Later in the spring the mature larvae will drop to the ground and remain there through summer and fall, and over the winter. Then next spring the adult midge will emerge, and lay its eggs. The cycle repeats and there is usually one generation per year. Description: Adult gall midges are minute flies that rarely exceed ½ in length. Mature larva is about 1 ½ inches long, whitish, and usually has a sclerotized plate on the ventral surface of the mesothorax. Vein pocket galls are hard, tan-colored rolls or tube swellings along the midrib and major veins and leaf margins of oak trees. Control: Establish an organic program and spray with Garrett Juice and Bio Wash.